Arie de Vois (Voijs or Voys), Dutch painter. He was the son of Alewijn de Vois from Utrecht, who was appointed organist of the St Pieterskerk, Leiden, in 1635. Arie received his first training in Utrecht from Nicolaus Knpfer (c. 1603-55), who also taught Jan Steen. He then studied in Leiden with Abraham van den Tempel , who lived there between 1648 and 1660. De Vois joined the Leiden Guild of St Luke on 16 October 1653 and paid his dues until 1677, serving as headman in 1664-65 and dean in 1662-64 and 1667-68. 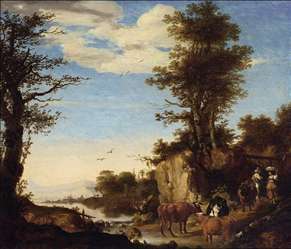 Houbraken s remark that he turned idle after marrying a wealthy woman is belied by the large number of paintings he produced, both surviving and mentioned in inventories and sale catalogues, and by the fact that his wife, Maria van der Vecht, whom he married on 5 February 1656, was not rich.